I tried to dress down a bit for the DLSU Bloggers Congress 2 last Saturday. Since it was held in a university, I didn’t want to go all out fashion blogger on them. For this look, I chose pieces in earth colors. If you’re going for simple, sticking to earth tones and neutrals is always the easiest way to achieve this. Chicify is like a local virtual mall. Aside from its own brand, they also carry other brands like Cole Vintage, Mich Araullo, Salsa Trends, Willow Clothing and more. I LOVE my new bangles from Island Girl! Would you believe that all Island Girl’s products are made of natural materials sourced from our very own country? Everything is proudly Philippine made, from the materials down to the craftsmanship. 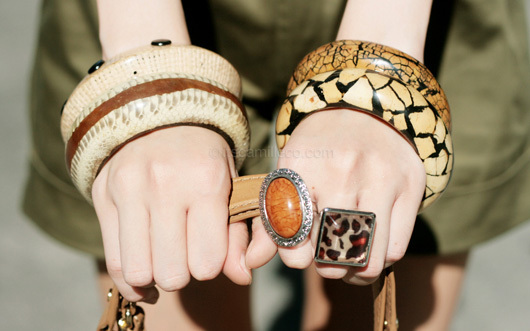 It’s actually the first ever Philippine brand to offer a complete range of trendy BUT eco-friendly fashion accessories. Wow! It’s no surprise that Island Girl has been well-received at trade showsÂ held in Milan, Paris and Hong Kong. Their products have actually been exported around the world for several years already. Some have even been sold to major brands abroad, such as Parfois, Mango, Promod, Miss Sixty and top Spanish department store chain, El Corte Ingles. If you want to see more of Island Girl, you can drop by their showroom at Unit 14AB, Tower 2 Olympic Heights, Eastwood City, Libis. They’re open everyday from 10AM to 9PM. You can also text them at 09173288990. Global Pinoy Bazaar at Rockwell Tent on November 5-6. St. James Christmas Bazaar at Ayala Alabang on November 26-30. Port 88 Christmas Bazaar at Megatent, Ortigas on December 10-11.